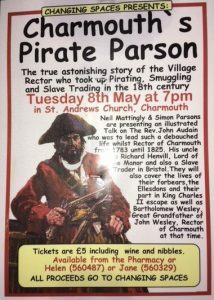 Neil Mattingly and Simon Parsons are presenting ‘Charmouth’s Pirate Parson’ in aid of Changing Spaces for St Andrew’s Church. We hope you can come along and learn about this intriguing history. Tuesday 8th May 2018 at 7pm at St Andrew’s Church. This entry was posted in Uncategorized on April 15, 2018 by Amanda Jones.